The Weimar Republic (German: Weimarer Republik ( )) is a name given by historians to the federal republic and semi-presidential representative democracy established in 1919 in Germany to replace the imperial form of government. It is named after Weimar, the city where the constitutional assembly took place. 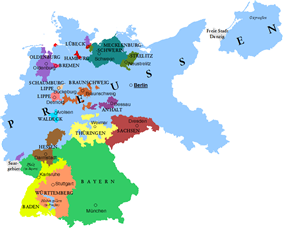 During this period, and well into the succeeding Nazi era, the official name of the state was German Reich (Deutsches Reich), which continued on from the pre-1918 Imperial period. 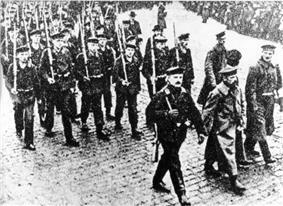 Following World War I, the republic emerged from the German Revolution in November 1918. In 1919, a national assembly was convened in Weimar, where a new constitution for the German Reich was written, then adopted on 11 August of that same year. In its fourteen years, the Weimar Republic faced numerous problems, including hyperinflation, political extremists (with paramilitaries – both left and right wing) and continuing contentious relationships with the victors of World War I. 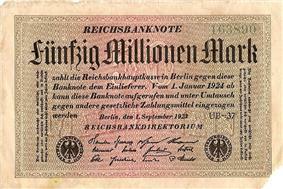 However, the Weimar Republic successfully reformed the currency, unified tax policies and the railway system and it did eliminate most of the requirements of the Treaty of Versailles, in that Germany never completely met the disarmament requirements, and eventually only paid a small portion of the total reparations required by the treaty, which were reduced twice by restructuring Germany's debt through the Dawes Plan and the Young Plan. The German government during the Weimar Republic era did not respect the Treaty of Versailles that it had been pressured to sign, and various government figures at the time rejected Germany's post-Versailles borders. Gustav Streseman as German foreign minister in 1925 declared that the reincorporation of territories lost to Poland and Danzig in the Treaty of Versailles was a major task of German foreign policy. General Hans von Seeckt (head of the Reichswehr command from 1920 to 1926) supported an alliance between Germany and the Soviet Union to invade and partition Poland between them to restore the German–Russian border of 1914. The Reichswehr Ministry memorandum of 1926 declared its intention to seek the reincorporation of German territory lost to Poland as its first priority, to be followed by the return of the Saar territory, the annexation of Austria, and remilitarization of the Rhineland. The ensuing period of liberal democracy lapsed by 1930, when President Hindenburg assumed dictatorial emergency powers to back the administrations of Chancellors Brüning, Papen, Schleicher, and finally Hitler. Between 1930 and 1933 the Great Depression, even worsened by Brüning's policy of deflation, led to a surge in unemployment. 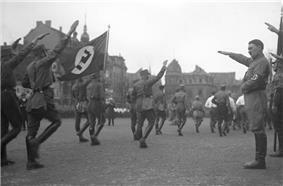 It led to the ascent of the nascent Nazi Party in 1933. 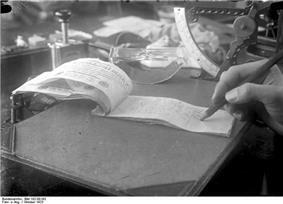 The legal measures taken by the new Nazi government in February and March 1933, commonly known as the Machtergreifung (seizure of power), meant that the government could legislate contrary to the constitution. The constitution became irrelevant, so 1933 is usually seen as the end of the Weimar Republic and the beginning of the Third Reich. 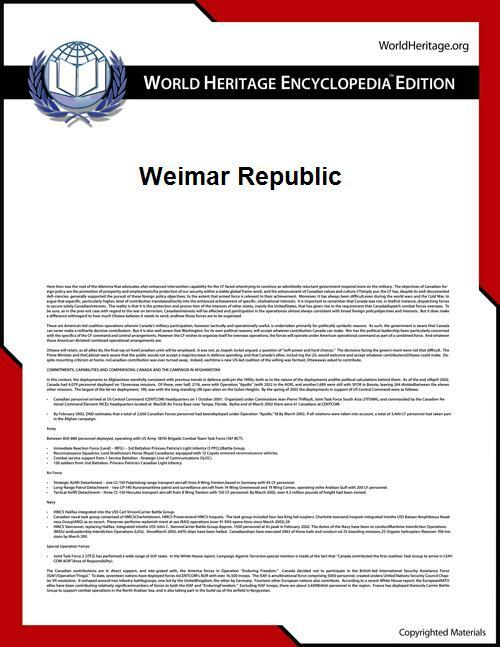 The first recorded mention of the term "Republik von Weimar" ("Republic of Weimar") came in a witheringly derogatory context, during a speech delivered by an opposition leader at a Nazi Party rally in Munich on 24 February 1929, and it was a few weeks later that the same opposition politician, Adolf Hitler, first used the term "Weimar Republik" in a newspaper article. 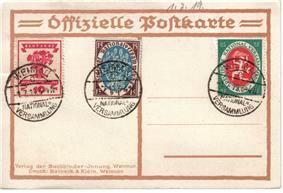 Only during the 1930s did the term become more widely used both within and outside Germany. Naval ensign of the Reichsflotte (1848–1852). The sailors' rebellion, November 1918. 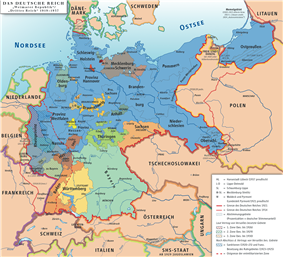 In October 1918, the constitution of the German Empire was reformed to introduce a parliamentary system similar to the British, but this soon became obsolete. On 29 October, rebellion broke out in Kiel among sailors. There, sailors, soldiers and workers began electing workers' and soldiers' councils (Arbeiter und Soldatenräte) modeled after the soviets of the Russian Revolution of 1917. 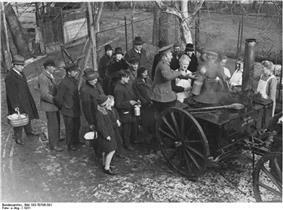 The revolution spread throughout Germany, and participants seized military and civil powers in individual cities. The power takeover was achieved everywhere without loss of life. On 9 November 1918, the "German Republic" was proclaimed by MSPD member Philipp Scheidemann at the Reichstag building in Berlin, to the fury of Friedrich Ebert, the leader of the MSPD, who thought that the question of monarchy or republic should be answered by a national assembly. 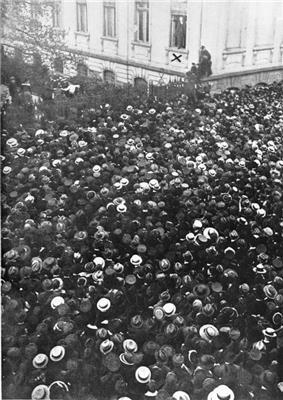 Two hours later, a "Free Socialist Republic" was proclaimed, 2 km (1.2 mi) away, at the Berliner Stadtschloss. The proclamation was issued by Karl Liebknecht, co-leader (with Rosa Luxemburg) of the communist Spartakusbund (Spartacist League), a group of a few hundred supporters of the Russian revolution that had allied itself with the USPD in 1917. In a legally questionable act, Reichskanzler Prince Max of Baden transferred his powers to Friedrich Ebert, who, shattered by the monarchy's fall, reluctantly accepted. In view of the mass support for more radical reforms among the workers' councils, a coalition government called "Council of the People's Deputies" (Rat der Volksbeauftragten) was established, consisting of three MSPD and three USPD members. 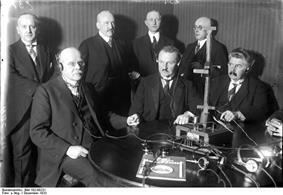 Led by Ebert for the MSPD and Hugo Haase for the USPD it sought to act as a provisional cabinet of ministers. But the power question was unanswered. 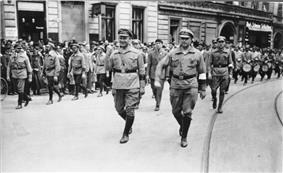 Although the new government was confirmed by the Berlin worker and soldier council, it was opposed by the Spartacist League. A number of other reforms were carried out in Germany during the revolutionary period. It was made harder for estates to sack workers and prevent them from leaving when they wanted to; under the Provisional Act for Agricultural Labour of 23 November 1918 the normal period of notice for management, and for most resident labourers, was set at six weeks. In addition, a supplementary directive of December 1918 specified that female (and child)workers were entitled to a fifteen-minute break if they worked between four and six hours, thirty minutes for workdays lasting six to eight hours, and one hour for longer days. A decree of the 23rd of December 1918 established committees (composed of workers’ representatives “in their relation to the employer”) to safeguard the rights of workers. The right to bargain collectively was also established, while it was made obligatory “to elect workers’ committees on estates and establish conciliation committees.” A decree of the 3rd of February 1919 removed the right of employers to acquire exemption for domestic servants and agricultural workers. During the debates in Weimar, fighting continued. A Nazi Party, and societies of exiled Russian Monarchists. Sporadic fighting continued to flare up around the country. In eastern provinces, forces loyal to Germany's fallen Monarchy fought the republic, while militias of Polish nationalists fought for independence: Great Poland Uprising in Provinz Posen and three Silesian Uprisings in Upper Silesia. Once the economic situation had stabilised, Stresemann could begin putting a permanent currency in place, called the Rentenmark (1924), which again contributed to the growing level of international confidence in the German economy. The 1920s saw a remarkable cultural renaissance in Germany. During the worst phase of hyperinflation in 1923, the clubs and bars were full of speculators who spent their daily profits so they would not lose the value the following day. Berlin intellectuals responded by condemning the excesses of capitalism, and demanding revolutionary changes on the cultural scenery. Influenced by the brief cultural explosion in the Soviet Union, German literature, cinema, theatre and musical works entered a phase of great creativity. Innovative street theatre brought plays to the public, and the blasphemy. Nazi Party (NSDAP) leader Adolf Hitler saluting members of the Sturmabteilung (SA), 1932. Hitler learned from Papen that the general had no authority to abolish the Reichstag parliament, whereas any majority of seats did. The cabinet (under a previous interpretation of Article 48) ruled without a sitting Reichstag, which could vote only for its own dissolution. Hitler also learned that all past crippling Nazi debts were to be relieved by German big business. On 22 January, Hitler's efforts to persuade Oskar von Hindenburg (the President's son) included threats to bring criminal charges over estate taxation irregularities at the President's Neudeck estate; although 5,000 acres (20 km2) extra were soon allotted to Hindenburg's property. Outmaneuvered by Papen and Hitler on plans for the new cabinet, and having lost Hindenburg's confidence, Schleicher asked for new elections. On 28 January, Papen described Hitler to Paul von Hindenburg as only a minority part of an alternative, Papen-arranged government. The four great political movements, the SPD, Communists, Centre, and the Nazis were in opposition. 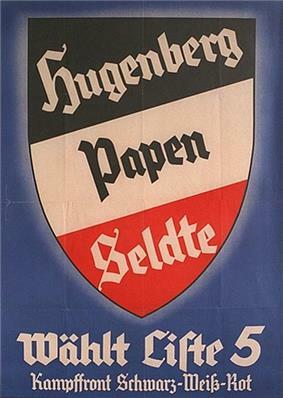 On 29 January, Hitler and Papen thwarted a last-minute threat of an officially sanctioned Reichswehr takeover, and on 30 January 1933 Hindenburg accepted the new Papen-Nationalist-Hitler coalition, with the Nazis holding only three of eleven Cabinet seats. Later that day, the first cabinet meeting was attended by only two political parties, representing a minority in the Reichstag: The Nazis and the German National People's Party (DNVP), led by Alfred Hugenberg, with 196 and 52 seats respectively. Eyeing the Catholic Centre Party's 70 (plus 20 BVP) seats, Hitler refused their leader's demands for constitutional "concessions" (amounting to protection) and planned for dissolution of the Reichstag. Hindenburg, despite his misgivings about the Nazis' goals and about Hitler as a personality, reluctantly agreed to Papen's theory that, with Nazi popular support on the wane, Hitler could now be controlled as Chancellor. This date, dubbed by the Nazis as the Machtergreifung (seizure of power), is commonly seen as the beginning of Nazi Germany. However, the moment in German history when the democratic principles of the constitution and personal liberty came to an end was Hindenburg's appointment of Brüning as Chancellor. At the meeting of the new cabinet on 15 March, Hitler introduced the Enabling Act, which would have authorised the cabinet to enact legislation without the approval of the Reichstag. Meanwhile, the only remaining question for the Nazis was whether the Catholic Centre Party (Zentrum) would support the Enabling Act in the Reichstag, thereby providing the ⅔ majority required to ratify a law that amended the constitution. Hitler expressed his confidence to win over the Centre's votes. Hitler is recorded at the Nuremberg Trials as being sure of eventual Centre Party Germany capitulation and thus rejecting of the DNVP's suggestions to "balance" the majority through further arrests, this time of Social Democrats. Hitler however assured his coalition partners that arrests would resume after the elections and, in fact, some 26 SPD Social Democrats were physically removed. After meeting with Centre leader Monsignor Ludwig Kaas and other Centre Trade Union leaders daily and denying them a substantial participation in the government, negotiation succeeded in respect of guarantees towards Catholic civil-servants and education issues. Most historians agree that many industrial leaders identified the Weimar Republic with labour unions and with the Social Democrats, who had established the Versailles concessions of 1918/1919. Although some did see Hitler as a means to abolish the latter, the Republic was already unstable before any industry leaders were supporting Hitler. Even those who supported Hitler's appointment often did not support Nazism in its entirety and considered Hitler a temporary solution in their efforts to abolish the Republic. Industry support alone cannot explain Hitler's enthusiastic support by large segments of the population, including many workers who had turned away from the left. The use of proportional representation meant any party with a small amount of support could gain entry into the Reichstag. This led to many small parties, some extremist, building political bases within the system. Yet, the Reichstag of the monarchy was fractioned to a similar degree, even though elected by majority vote (under a two-round system). The republic did not fall due to the small parties, but to the strength of the communists, conservatives and national socialists. Nevertheless, the modern German Bundestag has introduced a 5% threshold limit for a party to gain parliamentary representation. Germany during the Weimar period. The largest state, the Free State of Prussia, is shown in blue. These states were gradually de facto abolished under the Nazi regime via the states of Germany. ^ a b Christian Leitz. Nazi Foreign Policy, 1933-1941: The Road to Global War. p10. ^ a b Eva-Maria Schnurr (September 2014). "Der Name des Feindes: Warum heißt der erste deutsche Demokratie eigentlich "Weimarer Republik?"". 5/2014 (Der Spiegel - Geschichte 3 Hausmitteilung 137 Impressum ed.). ^ Diest, Wilhelm; Feuchtwanger, E. J. (1996). "The Military Collapse of the German Empire: the Reality Behind the Stab-in-the-Back Myth". War in History 3 (2): 186–207. ^ Ruth Henig. "The Weimar Republic 1919-1933". ^ As Kershaw notes (p. 468 ), after the passage of the Act, "Hitler was still far from wielding absolute power. But vital steps toward consolidating his dictatorship now followed in quick succession." ^ a b Klemperer, Klemens von (1992). German Resistance Against Hitler:The Search for Allies Abroad 1938–1945. Oxford: OUP / Clarendon Press. Berghahn, V. R. (1982). Modern Germany. Cambridge, UK: Cambridge University Press. Bookbinder, Paul (1996). Weimar Germany: the Republic of the Reasonable. Manchester, UK: Manchester University Press. Childers, Thomas (1983). The Nazi Voter: The Social Foundations of Fascism in Germany, 1919–1933. Chapel Hill: University of North Carolina Press. Feuchtwanger, Edgar (1993). From Weimar to Hitler: Germany, 1918–1933. London: Macmillan. Hamilton, Richard F. (1982). Who Voted for Hitler?. Princeton, N.J.: Princeton University Press. James, Harold (1986). The German Slump: Politics and Economics, 1924–1936. Oxford, Oxfordshire: Clarendon Press. Kaes, Anton; Jay, Martin; Dimendberg, Edward (eds.) (1994). The Weimar Republic Sourcebook. Berkeley: University of California Press. Nicholls, Anthony James (2000). 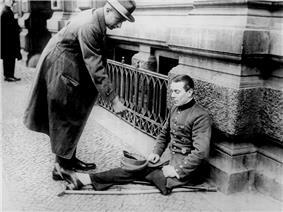 Weimar And The Rise Of Hitler. New York: St. Martin's Press,. Weitz, Eric D. (2007). Weimar Germany: Promise and Tragedy. Princeton: Princeton University Press. Widdig, Bernd (2001). 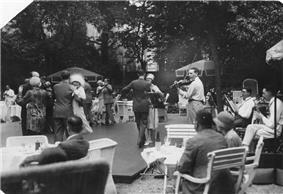 Culture and Inflation in Weimar Germany. Berkeley, CA: University of California Press.